Friends, Today's Topic is Free Google Online Internet Marketing Certificate Hasil Kare? How did one become a Google Certified Digital Marketer? This is one of the most important tips for those who are interested in Search Engine Marketing, Pay-Per-Click, SEO, Social Media and Video Marketing and want to make a career. In today's times, many institutes take thousands of rupees in the name of Internet Marketing Course and Certificate. I have seen a lot of organizations who charge this 10K-15K for the Google Free Internet Marketing Certification course. 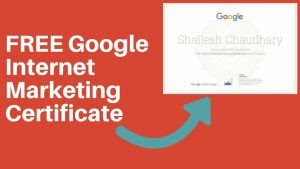 What is the Google Online Internet Marketing Certificate? Google Online Internet marketing course, which we also know as "Google Digital Garage" This is Google's service which offers Free Digital Marketing Course. With this, if we successfully complete its courses and exams, we also get a certificate. The main goal of Google Digital Garage is that everyone can get information about Internet Marketing and can help them grow their business and career in the field of Internet. There is total 106 Lesson in Google digital garage's internet marketing course and they are distributed among 26 different badges. What do we learn from Google Digital Garage Course? I had completed this course in 7 days so that I could understand every part of it and implement it. Here is my certificate and such a certificate can be found by you, if you are interested in internet marketing. If we talk about what we can learn in this Google Digital Marketing course. So the answer is. If we talk about what fields we get related information, then the answer is, whatever is related to Digital Marketing on Internet, we get everything to learn. Some of them are important topics. There is no requirement of any kind of academic qualification for this course, just to start the Google Digital Garage Course, we have an email address. Note: Whatever email address you use for this course, carefully check that the name you have on it should be yours. The name which is with the name of the email address is printed on the same certificate. After signing in, our internet marketing course starts and we have to learn the course through video or text one by one and complete the related assignment. When we complete a total of 106 courses, we have to take a final exam. After that we get the option to download the certificate on our profile. Friends, Google Internet Marketing Certificate is very helpful for our Career and with this, we can also do Free Online Digital Marketing Course. If you have questions or suggestions related to it, then you must comment.